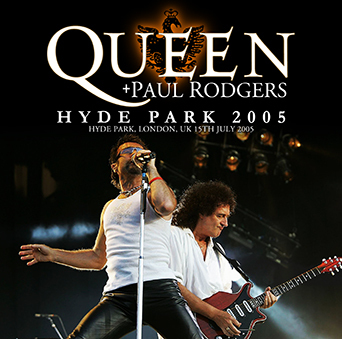 Recorded: Live at Hyde Park, London, UK 15th July 2005. Comments: This show was first released on 2cdr by Japanese Trail label in August 2005, with the same title Hyde Park 2005 (Trail). I'm not sure if Uxbridge has use a new recording source on this release. It's claimed to be from master recording. QUEEN + Paul Rodgers' highest peak and masterpiece masterpiece that was acclaimed are original recordings. That 's recorded in that name is "London performance on July 15, 2005". This week will be a live album, which will be a London trio copy, but at a time it is a complete version of this album, it is one of the best masterpieces. However, even though it is the same London recording, the time of this work is slightly shifted. Let's confirm the position on a schedule. This is the summary of 2005 when they started. From March to May, we performed a series of tours "Europe # 1", then rested for about a month and a half. We also held a small tour "Europe # 2" with 4 shows in July. The official work "RETURN OF THE CHAMPIONS" and simultaneous release "BRIXTON ACADEMY 2005 (Uxbridge 946)" "WEMBLEY PAVILION 2005 (Uxbridge 947)" was the record of the main "Europe # 1" It is Europe # 2. Such a work is a superb audience recording that was said to be the highest peak in the London trilogy. What's great is what sounds on. Anyway, it is clear and sturdy, singing voice and performance are not blurred to details. Although the London trilogy which is released at the same time this week is all masterpiece, this work is outstanding with a feeling like a sound board. That factor is probably in the venue. Whereas the other two were indoor recordings, this work is outdoor Hyde Park. There are no walls or ceilings to produce echoes. Of course, it is not necessarily a name recording if it is outdoors, but there is also a risk that the sound will flow in the wind or the bass will become a skyca. However, whether this work was recorded very close to PA or not, it has picked up the powerful sound output of PA for outdoor as it is without such a drawback. As a matter of fact, although the exquisite venue response delicious "WEMBLEY PAVILION 2005" can not be abandoned as well, the line-like sound of this work was a big topic at the time and reigned as the highest peak in the Europe tour. The show drawn with such sound is amazing again. Anyway, the legend of 1976 is also a huge Hyde Park. Not to mention the London trilogy, it is a show that will definitely highlight the entire European tour, and the performance performed on the big stage is so wonderful. Originally it was supposed to be held on July 8th a week ago, but the terrorist attacks of London occurred the day before that. It was a postponement of receiving that influence to Moro. It is John Lennon 's "Imagine" that makes sense of the times transparent. Brian says, "I want to sing a special song on this special night, I want to express with this song rather than words," he stole the anthem of peace. Brian, Roger and Rogers singing that beautiful melody and words, the audience gathered at Hyde Park becomes a thick chorus corps and follows it. Of course, this name scene was also seen as a bonus image of "RETURN OF THE CHAMPIONS", and the chorus was also featured. However, the workplace feeling of this work is overwhelming. Unlike the official chorus that was mixed artificially, the waves of the big chorus to return along with the melody are very natural and beautiful. And the unknown name scene is "We Are The Champions". After the end of "We Will Rock You", I was led by MC Brian "special guest of this evening, police who saved London, men and women staff of emergency room, dedicated to their real champions" We Are The Champions "begins. Rogers' soulful vocalization pours a deep emotion into the glory melody and heals the hearts of the injured Londoners. Unlike Freddie, it is a wonderful performance and singing voice. Why does Paul Rogers sing QUEEN? The workplace also became a turbulent excitement for such a great performance that condensed its significance into one song, and it got a big circle. QUEEN + Rogers can also taste the best name scene with the finest soundboard sound. 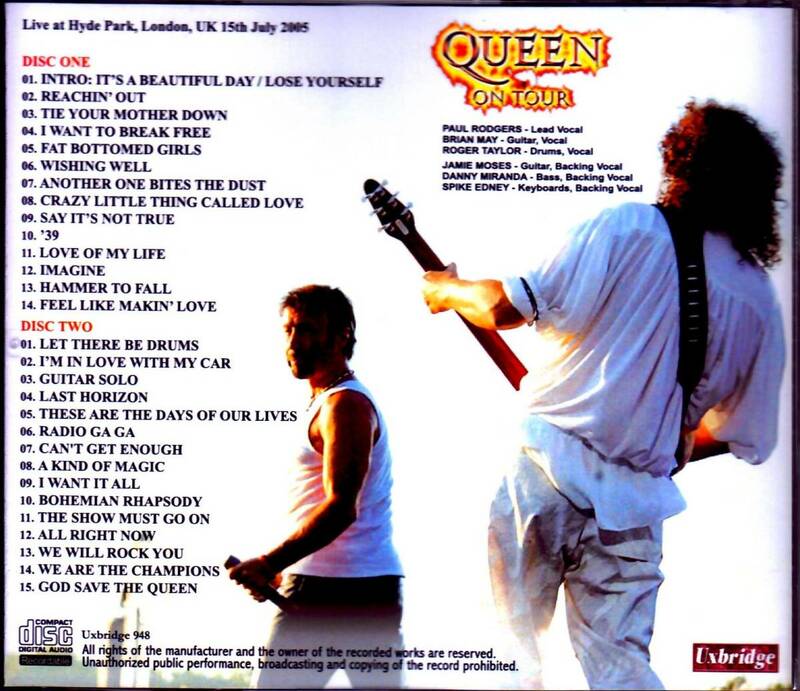 QUEEN + Paul Rodgers sang a masterpiece on Freddie's dead earth. It is one release of trilogy which draws show at home hometown London with the finest sound. Among them, it is one that becomes the best masterpiece in terms of sound quality, great performance. "BRIXTON ACADEMY 2005", a vast chorus is impressive, "WEMBLEY PAVILION 2005" which is unique to the audience unique to the audience, and this book of the great circle. Three tastes delicious great masterpieces, so if you can, please enjoy all three. However, it is only this work if it becomes "one of the first". It is exactly the live album of the live album representing 2005. Please, please enjoy plenty.